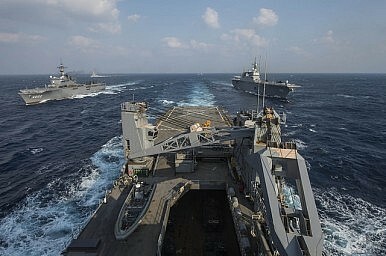 U.S. and Japanese ships participate in Keen Sword. The United States’ alliance with Japan can grow stronger still. Today marks the beginning of Japanese Prime Minister Shinzo Abe’s official visit to Washington D.C. His visit will include a meeting with President Obama and an address to a joint session of Congress. Perhaps more importantly, however, Prime Minister Abe’s visit marks a pivotal moment in the U.S.-Japan alliance – a historic change that will benefit both allies and the Asia-Pacific region as a whole. This change is Japan’s decision to embrace the policy of collective self-defense and adopt new guidelines for U.S.-Japan defense cooperation. These changes will allow Japan to play a greater role in our partnership while also making their nation more secure. Prime Minister Abe’s visit is a good opportunity to recognize the enduring importance of our alliance with Japan and reaffirm our shared commitment to peace and prosperity in the Asia-Pacific. Since the end of World War II, Japan has become one of the world’s most successful democracies and a pillar of stability in the Asia-Pacific region. In the aftermath of that devastating conflict, Japan renounced war and “the threat or use of force as a means of settling international disputes” in its constitution and codified its “desire to occupy an honored place in an international society striving for the preservation of peace.” True to its goals and principles, Japan stands 70 years later as a shining example of a responsible actor and stakeholder in Asia and the broader international system. Although indisputably a great power with impressive economic, diplomatic, and cultural influence, modern Japan has kept its Self-Defense Forces small but capable, and never threatened its neighbors. Unfortunately for Japan, however, not all its neighbors have followed that example. Unlike Japan, China has harnessed its economic growth to field large and increasingly sophisticated military forces capable of projecting power against its neighbors. Emboldened by its growing might, Beijing has been waging a campaign of “gray zone” aggression against its neighbors, and aggressively asserting its revisionist territorial claims by repeatedly sending ships and aircraft into their airspace and waters. North Korea, meanwhile, continues to menace Japan with ballistic missiles and weapons of mass destruction. And in January, Japan had to watch as ISIS brutally murdered two of its citizens. In response to these challenges, Prime Minister Abe is making important changes to Japan’s defense policies. These changes are appropriate to Japan’s strategic situation and admirably self-restrained. In keeping with its goals and values, Japan will remain focused on defense and limited in its ability to project power against other countries. Under the new policy and defense cooperation guidelines, however, Japan will be able to play a more proactive role in the U.S.-Japan alliance and in bolstering regional security more broadly. While Japan’s Self Defense Forces will still be constrained in when they can use force, they will now be able to respond to more forms of aggression (including space and cyber-attacks) and support the United States in a wider variety of contingencies. Able to better coordinate their actions, U.S. and Japanese forces will be better able to deter — and if necessary defeat — the full spectrum of threats that the alliance faces. Tomorrow, the U.S. House of Representatives will put the finishing touches on the FY2016 National Defense Authorization Act. In recognition of the importance of the U.S.-Japan alliance and the historic developments taking place, we intend to offer an amendment supporting Japan’s policy changes and reiterating the United States’ commitment to Japan. The United States already has strong security ties with Japan, but they can and should be stronger still. With the stability of the Asia-Pacific region increasingly under threat, Japan must stand strong with the United States by its side. Tokyo’s decision to adopt collective self-defense is a good-faith effort to do more to support the U.S.-Japan alliance and other responsible stakeholders in the Asia-Pacific region. We look forward to Prime Minister Abe’s visit and hope that our friendship lasts for many years. Rep. J. Randy Forbes (R-VA) is Chairman of the House Armed Services Seapower and Projection Forces Subcommittee and Co-Chairman of the Congressional China Caucus. Rep. K. Michael Conaway (R-TX) is the Chairman of the House Agriculture Committee and a member of the House Armed Services Committee. The Ukraine crisis may force Japan to choose between its alliance with the US and its outreach to Russia.